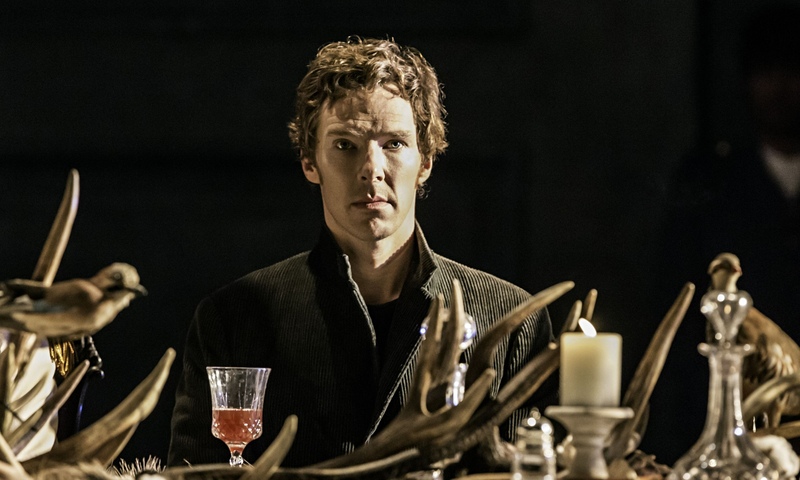 National Theatre Live’s recent telecast of Hamlet to cinemas around the world allowed Sherlock and Shakespeare fans in record numbers to enjoy Benedict Cumberbatch’s muscular and wide-ranging performance as the brooding Danish prince. Benedict’s Hamlet was by turns angry, grief-stricken, paralyzed by indecision, and manic—torn between carrying out his father’s wishes for revenge and his own moral decency. In case you don’t know, Hamlet is set shortly after the death of Hamlet’s father, the king of Denmark. Prince Hamlet is repulsed by the quick marriage of his mother, Gertrude, to his uncle Claudius, now the king. Hamlet sees his father’s ghost, who reveals that Claudius poisoned him and implores Hamlet to avenge his murder. Hamlet has been attracting the attention of the royal court with his strange behavior, which he attributes to his father’s untimely death and his mother and stepfather’s hasty marriage. Hamlet hatches a plot to provoke Claudius to reveal his guilt, setting in motion a chain of events with tragic consequences. Lyndsey Turner’s production’s costumes cut across different time periods—Gertrude’s and Ophelia’s costumes evoke the 1930s, perhaps a commentary on the outdated treatment of Hamlet’s female characters. Yet, notably, the younger male characters’ costumes—Hamlet’s and Horatio’s—are modern and casual: hoodies, t-shirts, and flannel. Claudius and Polonius wear military uniforms or formal suits, emphasizing the characters’ differences in age and status. No surprise, Benedict’s performance is energetic and engaging. He leaps on tables, sprints up the staircase and convincingly performs the fencing match with Laertes. We see flashes of the sardonic humor that Benedict brings to Sherlock Holmes, perhaps a tip of the deerstalker to Sherlock fans. Some of Hamlet’s longer speeches are delivered in Benedict’s signature hyper-verbal style, yet we still feel the emotion of Hamlet’s tortured indecision, his sometime cruelty, and his desire to set things right. In addition to Benedict’s excellent performance, Siân Brooke is moving and heartbreaking as Ophelia. Due to the success of the initial National Theater Live showing of Hamlet, additional screenings have been planned—get the details here. Have you seen Hamlet? Tell us about it in the comments!